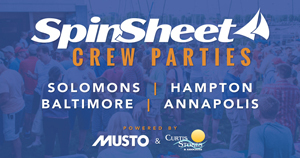 100 boats competing in Hampton and more than 90 in Annapolis for significant Chesapeake racing events June 1-3. Remembering Phebe, sailing to Oxford, and some drama: an interesting weekend on the Bay filled with wind (sometimes), storms, sailboat racing, and more. Labor Day 2017: here's your SpinSheet Racing Roundup for the weekend of September 2-4. Big breeze and long nights in August! Here’s your SpinSheet Racing Roundup for the weekend of August 4-6. Video, photos, and results of Annapolis Yacht Club's signature Wednesday Night Race series, the first race of the third and final series of summer 2017.